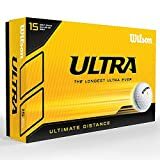 Made with distance players in mind, the Wilson Ultra Ultimate golf balls are the ideal choice for long distance swings. The ball includes an elliptical 432 dimple pattern and ensures proper spin and control over shots as well as high compression core providing high velocity. It’s coated with ionomer to delivers excellent playability and a good touch of resilience. The balls are supplied usefully in a pack of 15.